When I look at the ball, I predominantly see green but after the rib section I was wondering where the green was hiding. As the ankle grew it emerged and was truly wonderful. 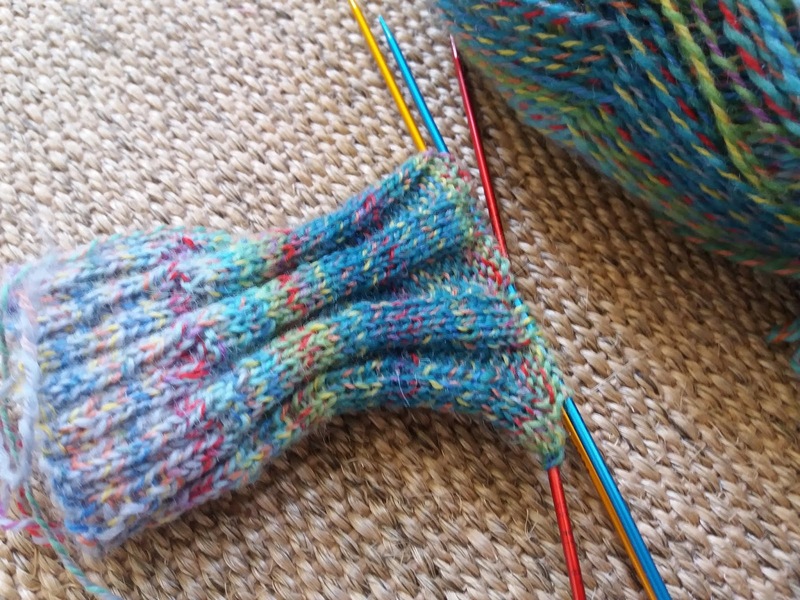 I used a sock pattern from Christina at Colourful life called the Mind the Gap sock which is a simple ribbed sock. Our good friends have announced they are having a baby in January. 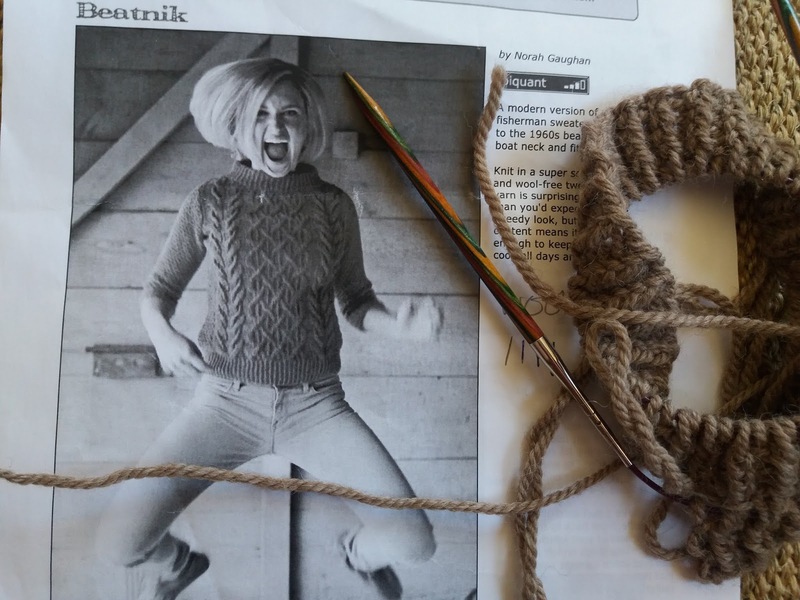 This news immediately makes me want to crochet. I have gone bonkers and ordered yarn for a blanket. 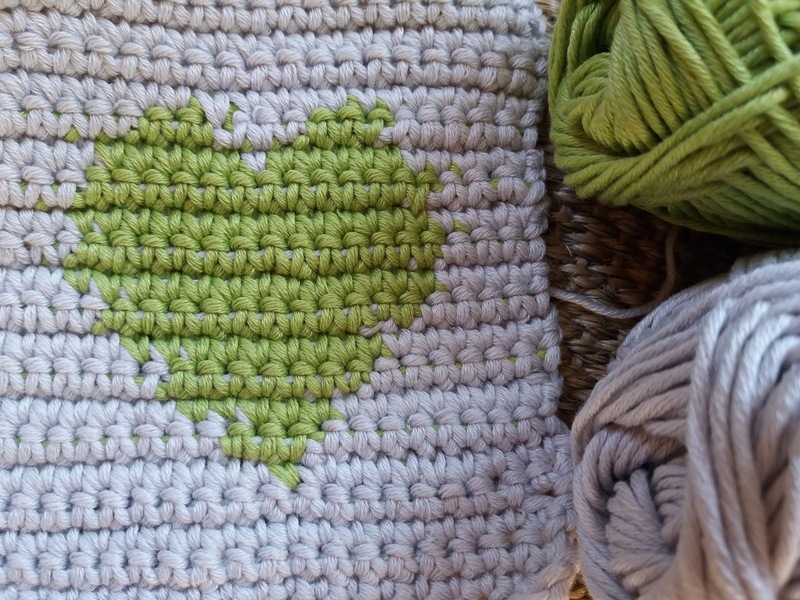 I have never done this before - I always use scraps for blankets. It is kind of why I make them but I loved a particular pattern called the Sweetheart and bought the yarn. The dad to be, Chris, is little M's godfather and sends her wonderful things for her birthday. However, true to my roots and impatient personality, I started a scrap one anyway whilst waiting for the delivery. This one has a strong boy theme and I will see how they both turn out. 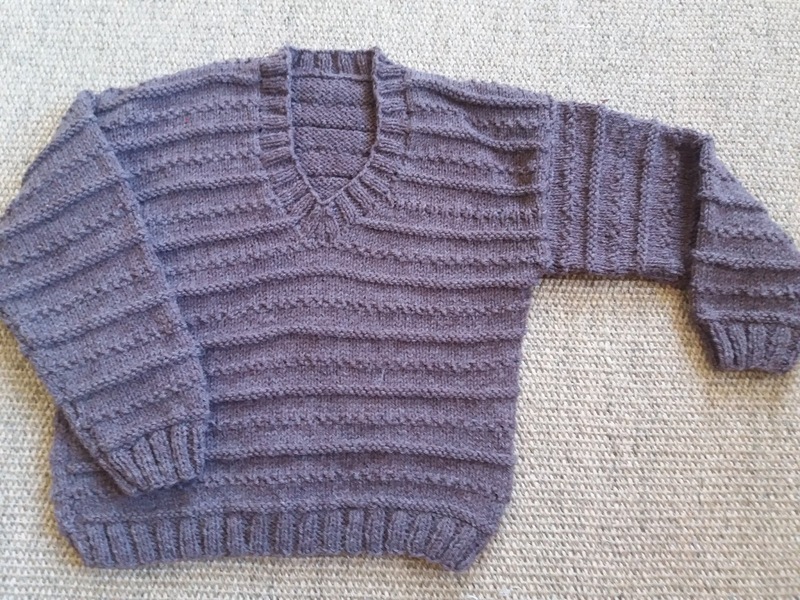 I have finished a little jumper for my friends boy. Nice pattern but not too taxing. This has been hanging around for a while but all done now. For the first time ever I got the V-neck right. 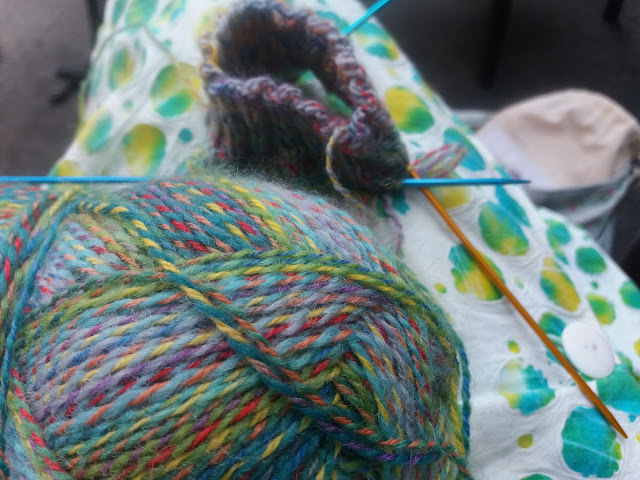 I always make a mess of this part of baby knits. I now know why. 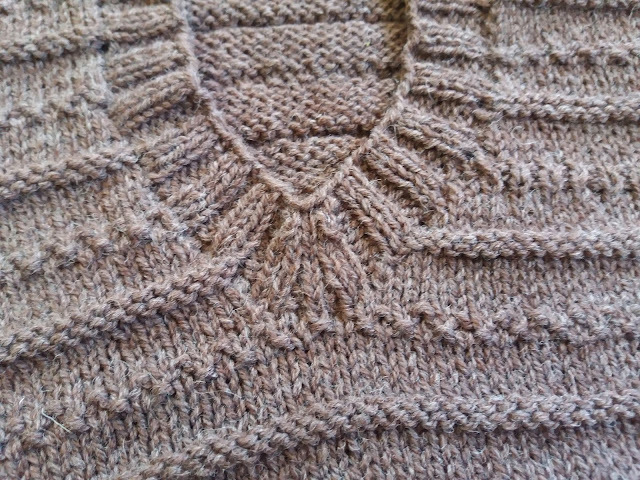 In the past I have picked up 'about' the right amount of stitches along the neckline. This time I did it properly and duh! it worked. Way down in the depths of my basket is my Beatnik sweater. I have done the back, now need to start the front. 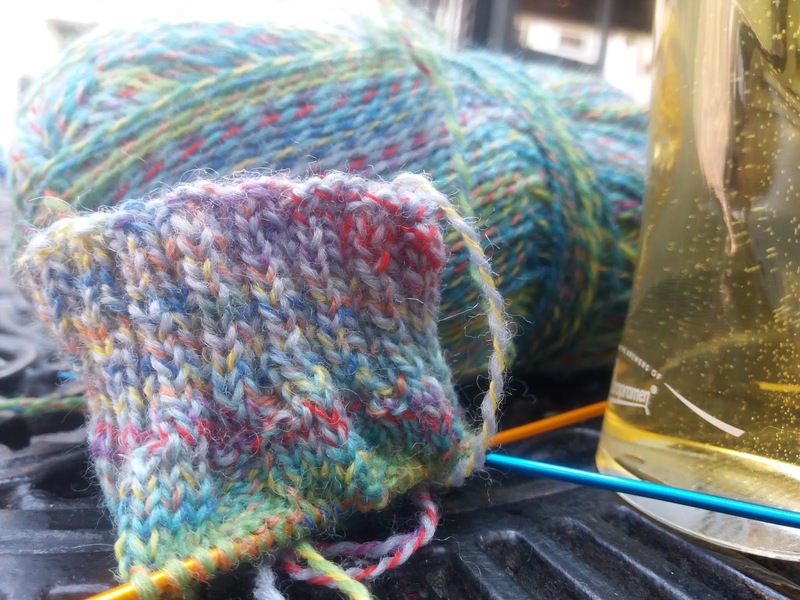 Twisted rib is like knitting with someone rubbing a cheese grater on your elbows. It feels so awkward, all that back of the loop stuff but I am pressing on so that I can get to the interesting cables. 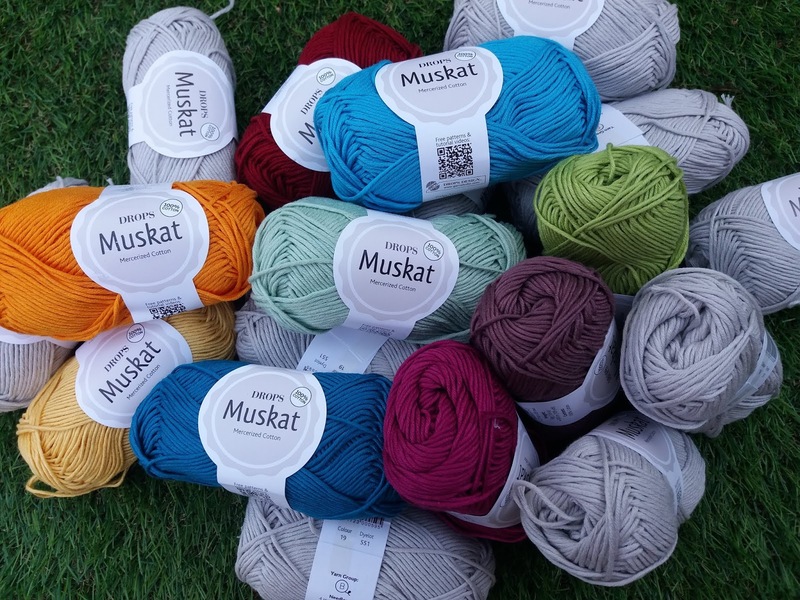 Lots of fun knitting and crochet to keep me busy/sane during the Summer holidays which are coming up soon. The summer holidays have already started here, its a joy to see the children on the beaches and playing in the crofts. I loved the yarn for the socks such a beautiful mix of colour reminding me of the moor here on the Island. 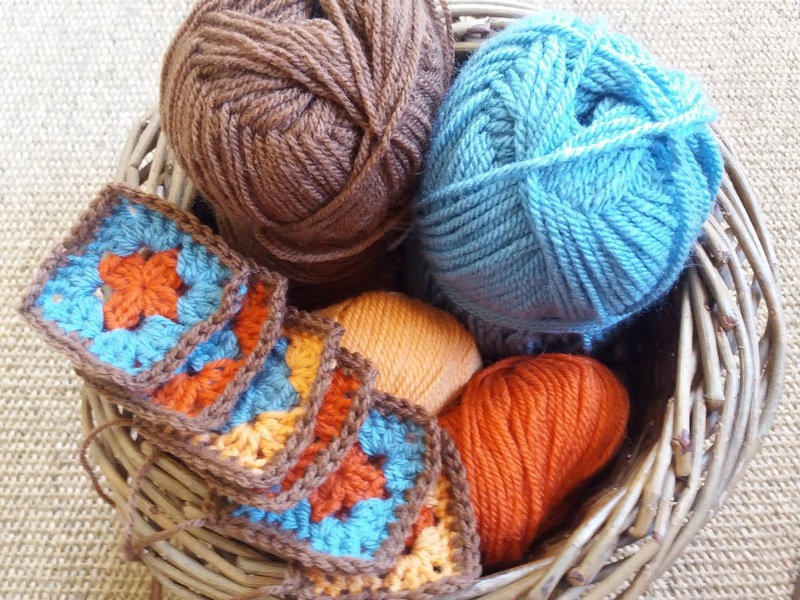 Like you I have several projects on the go, coasters, a rug, shawl and cushion cover. I don't know anyone who only makes one thing at a time. We are all as bad. I love casting on something new. Just started a cushion cover made with scraps. Making a dress, just straight and simple cotton. My poor hedgehogs, mummy and baby, along with a mouse are all waiting to be stuffed and sewed up. ( don't like that bit. Love the knitting bit) Love the colours of your squares. I love the project JO. the baby blanket is going to be a wonderful gift. Good luck with the new yarn.